What you get here is three new studio recorded tracks plus one live track. 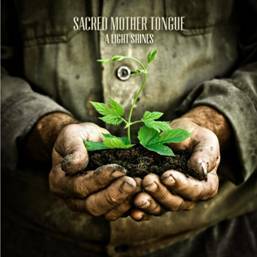 I really can't understand why Sacred Mother Tongue aren't much better known and playing much bigger venues. You've got world class guitar work from Andy James, some great clean vocals from Darrin South, and the bass and drums are spot on too giving the power and drive to the music. The music sits in that grey area between rock and metal - it's too heavy to fit easily in the rock category, but it's too rock-like to fit neatly into the metal category. While that may make it harder to describe them it does mean that their music will appeal to both rock and metal fans, giving them a potentially huge audience. After listening to the EP quite a few times, I can say one thing with confidence - the sooner they get the new album out the better. This is a great EP, and based on this I'm expecting the album to be pretty damn impressive too. A great EP thats well worth buying. "A light shines" is out now.